It’s a question that was asked by marketing strategist Chelsea Krost to a panel of four work management experts during the launch of Done Right: How Tomorrow’s Leaders Get Stuff Done. As the last question of an engaging night, the combined answers from the panelists have stuck with me since I heard them in person. The way each answer builds upon and complements the others is powerful, forming a playbook that any future leader should heed. If you want to lead in 2050, here’s what to do. Cynthia Boon, AVP of customer experience administration at GM, set the scene. It’s true: If you’re constantly overwhelmed because the way you worked in the past no longer works, you’ll drown. Change is the water we’re swimming in. It hasn’t always been this way. Until a few hundred years ago, you would have likely spent every working day of your life in a single profession: farming. 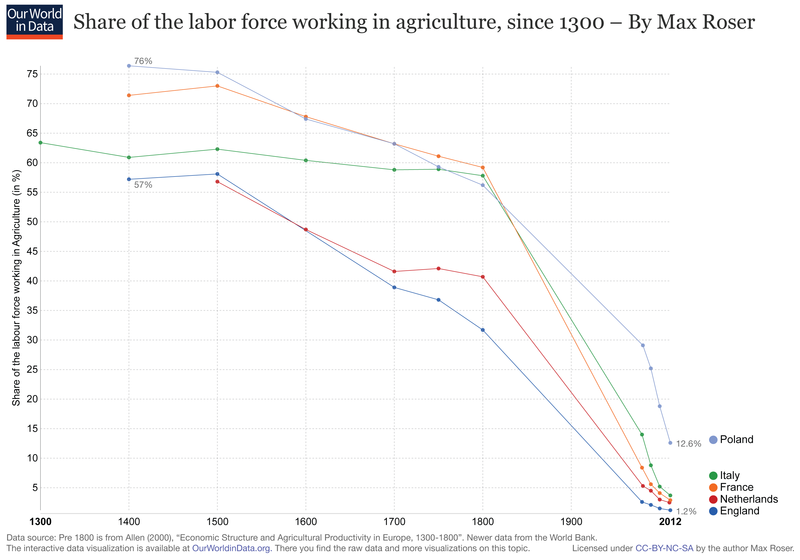 Since the 1300s, when such data started being tracked, the percentage of people working as farmers in European countries fell from around 75% in the 1300s down to roughly 2% today. In the United States 64% of all jobs were farming jobs as recently as the 1850s. (Today it’s 2%.) Back then you’d wake up every day and farm — and you’d likely do this one job until you were too feeble to work anymore. One job for life. Desk jobs, globalization, and university education changed that norm. While people stay at the same job longer today than people used to over the past four decades, we still change jobs far more often than people did hundreds of years ago when job options were almost nil. To reduce your anxiety in the face of change, you will need to be comfortable with ambiguity. However, changing jobs isn’t the only way that work today induces anxiety. Anxiety also comes from how much we must now continually learn new skills to keep up with a changing job market. Britney Robbins, founder and CEO at Gray Matter Experience, said that in her opinion the most marketable skill in the future is to embody a “zest for learning.” For her, it’s all about “being able to learn and grow from the experiences you have." Why? One reason is that automation kills (and creates) jobs. In our State of Work report, we found that 48% of U.S. workers say they know people who have already lost jobs because of automation. This trend will boom. University of Oxford professors Carl Benedikt Frey and Michael A. Osborne predict that automation will put 47% of US employment at risk over the next two decades. According to their data, the most at-risk fields (those with a 90-99% likelihood of not surviving) include telemarketers, insurance underwriters, loan officers, sports referees, bookkeepers, cashiers, restaurant cooks, hotel clerks, accountants, real estate brokers, and more. Those with a 70-90% likelihood include pharmacy aides, painters, mail sorters, proofreaders, subway operators, parking lot attendants, technical writers, taxi drivers, bus drivers, etc. If you’re in one of these professions, what will you do? That’s where having a zest for learning will be essential. Of course, you’ll also need the opportunity to learn. It might be via a private company such as Lambda School or PluralSight, or it might be via expanding public education to include trade schools, universities, and job retraining programs. However it happens, society will need to embrace opportunities for education at the same time that individuals embrace a zest for learning. We will have to work together to make it happen, and that’s going to require tremendous empathy. Sean Pederson, BCycle product development director at Trek, said that as we move toward an automated future, empathy will become more and more essential. This will require us to listen to each other — to truly understand where each team member is coming from. Without empathy, we’ll create a future none of us want. Douglas Rushkoff, author of Team Human, tells a story about being offered an enormous fee — about half his yearly salary — to give a single talk about the future of technology to a group of billionaire hedge managers. As the night wore on, Rushkoff realized they’d invited him there for one reason: They wanted to know how to control their security force in the wake of an economic collapse. In other words, Rushkoff realized these billionaires imagined a future void of empathy. Alex Shootman, CEO at Workfront, also rejects the pessimistic view of the future envisioned by people like the hedge fund managers mentioned above. For Alex, the most important skill a person can learn is the ability to get stuff done right. “There's just a quality about certain people who are finishers,” he said. “They finish strong, and they get stuff done.” It’s these people who — regardless of what’s happening on a societal level — will succeed today and tomorrow." It’s a simple suggestion, but in many ways it’s the sure-fire way to create the future you want. Chances are, you have little control over culture at large and which jobs will be eliminated by automation. But you do have control over whether you make a habit of getting things done right. This habit will carry you to success. So practice this skill right now, in whatever position you hold. Ask yourself what you can do to get your work done right and do it.